Yesterday, NASA announced with some fanfare that after 36 years in space, the probe Voyager 1 has entered interstellar space. I have two things to say here, and I want to be careful. First, this is an amazing event, and well worth celebrating. Second, a lot of people are saying Voyager 1 has left the solar system, and that’s not really accurate. First things first. 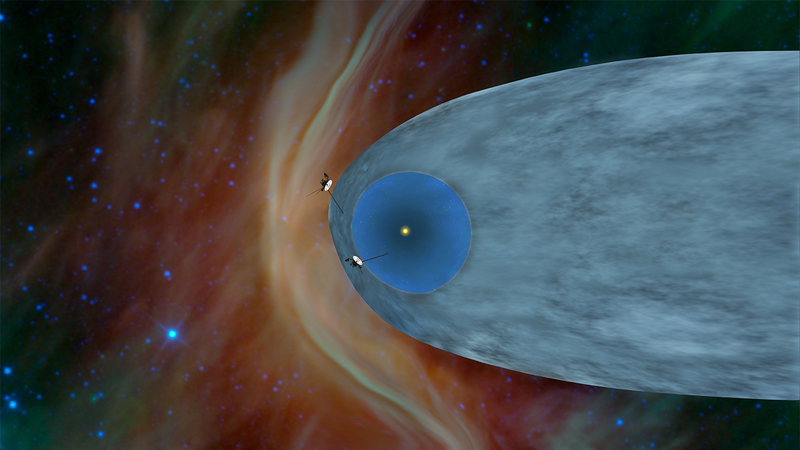 What scientists discovered is that in mid-to-late 2012, Voyager entered a new region of space. This all has to do with the solar wind, a stream of subatomic particles blown outward by the Sun. This wind expands outward, and far beyond the orbit of Neptune it encounters the particles that exist between the stars. It pushes those aside, and loses momentum as it does so. At some point, the pressure from the wind is no longer strong enough to expand against the pressure of those external particles, and it slows to a stop. This region is called the heliopause. For years, we’ve known that Voyager is in the fuzzy volume of space where the heliopause lies, but it’s been maddeningly difficult to know if it had punched through. The Sun then gave us a gift: a coronal mass ejection. These vast explosions of material sweep outward, and one went off in March 2012. After more than a year of travel, this blast reached the heliopause. When it did so, it interacted with the material there, causing it to vibrate. This type of interaction is detectable by Voyager, and when scientists analyzed the data, they realized the density of the material was far higher than expected. This is just what would happen if Voyager had in fact flown through the heliopause. So. It looks like, after traveling 19 billion kilometers (12 billion miles), one of our spacecraft has entered what can reasonably be considered interstellar space. But does this mean it has left the solar system? Well, no. That might seem odd, since I just said it’s in interstellar space, but that’s only when you look at the Sun’s influence on the particles out there. However, there’s more to our solar system’s far-flung suburbs than errant electrons and protons. Even out there, over 120 times farther from the Sun than the Earth’s orbit, there are more substantive objects: huge, frozen chunks of ice that are essentially giant comets. The Sun is surrounded by trillions of these iceballs, a countless swarm of them called the Oort Cloud. They take thousands of years to orbit the Sun even once, but enthralled to its gravity they are. This makes them bona fide solar system objects, and that’s why we can’t really say Voyager 1 has left the solar system. There’s still more solar system beyond it! It’s like walking outside the front door of your house and saying you’ve left your property. While you’ve left your house, there’s still the yard all around you. You have a ways to go yet. I make this point because the claim that Voyager has left the solar system has been made before. Many times. Many, many times. The latest was in March of this year, when some scientists announced they had detected a change in the environment Voyager was in, marking the boundary to interstellar space. That announcement was quickly contradicted by the Voyager team at JPL, including Voyager team leader Ed Stone. Full disclosure and mea culpa: I said at the time that Voyager had left the solar system, but then quickly backed off that claim when the Voyager team chimed in. However, with these new results, Stone has given his blessing. So while Voyager still has a ways to go (many thousands of years, actually) before it actually leaves what we can think of as our solar system, I think it’s fair to say it’s now in interstellar space. And this is an astonishing achievement for humanity. It was inevitable; we knew this would happen even before Voyager (and its twin Voyager 2) was even launched, in 1977. But still, after all these years, and so much terribly empty space traveled, this point has now been reached. Humanity is now an interstellar species. [Voyager] has slipped the surly bounds of the Sun’s influence and is still moving with enough velocity to carry it out into the galaxy. Our proxy, our envoy, is heading out to the stars, where it belongs. It’s just the first. There will be many more, some of which are already well on their way. Someday, perhaps, we may join them.